NASA Earth Observatory images by Lauren Dauphin, using Landsat data from the U.S. Geological Survey and MODIS data from NASA EOSDIS/LANCE and GIBS/Worldview. Story by Kasha Patel. 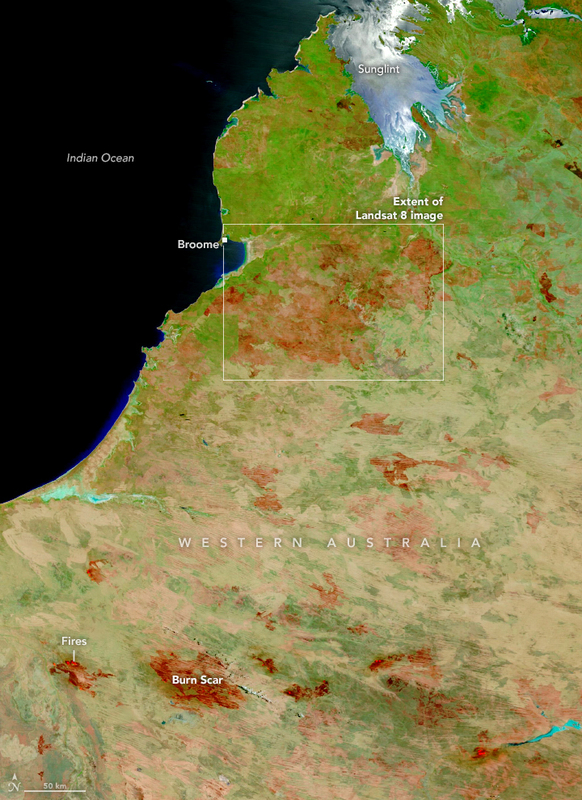 A fire in western Australia has burned at least 2 million acres of rural land—an area six times the size of Los Angeles. The blaze, about 120 kilometers (80 miles) southeast of Broome, was ignited by lightning on October 11, 2018, and grew larger as hot temperatures and windy conditions fanned the flames. 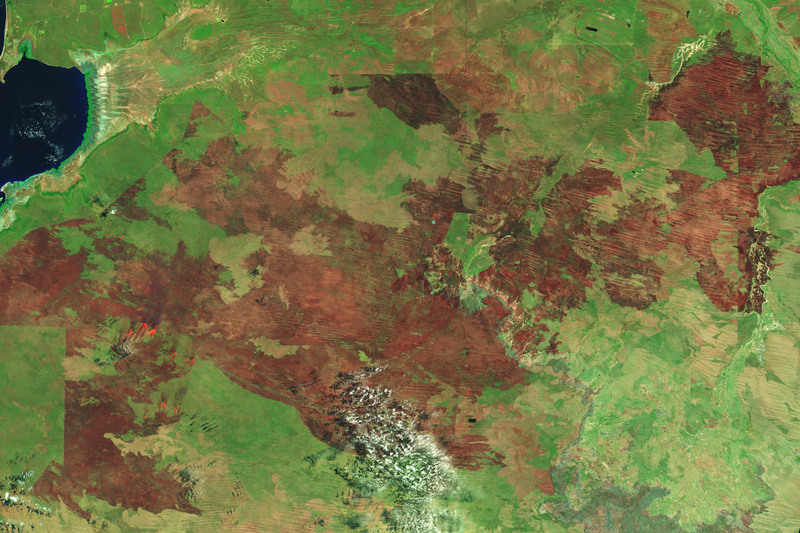 The Operational Land Imager (OLI) on Landsat 8 acquired an image (above) of the burn scar as it appeared on October 22, 2018. The image is false color (bands 7-5-4) to better differentiate burned areas (brown) from the surrounding landscape. The second image shows a wider view of fires across western Australia on November 6. The false-color image was acquired by the Moderate Resolution Imaging Spectroradiometer (MODIS) on NASA’s Terra satellite (bands 7-2-1). 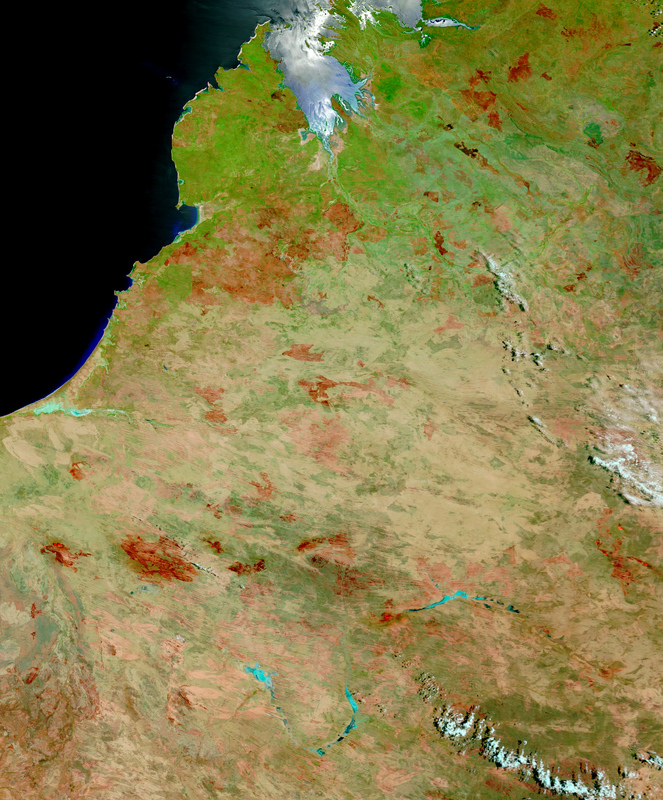 Fires on the Kimberley Plateau—the northernmost region of western Australia—are common from August to November, when the weather is hot and dry. The Kimberley is largely comprised of sparsely wooded savanna and tends to experience at least one large-scale fire every year, according to a news report. Last year, the Kimberley region experienced 300 fires, making it one of the worst seasons in the past decade. Officials have warned of upcoming heatwaves and a potentially dangerous bushfire season across Australia. Australian Institute of Criminology Understanding bushfire: trends in deliberate vegetation fires in Australia. Accessed November 6, 2018. 9news (2018, October 31) Fire authorities warning of ‘killer bushfire season’ as heatwaves stretches across Australia. Accessed November 6, 2018. WA today (2018, October 17) Lives and homes in danger after lightning sparks Broome bushfire. Accessed November 6, 2018. The Weather Channel (2018, October 29) Australia Bushfire Burns 2 Million Acres—Six Times the Size of Los Angeles. The West Australian (2018, October 25) Blaze spares lives, assets. Accessed November 6, 2018.